Welcome to the SEDIS web site. The Integrated Ocean Drilling Program (IODP 2003-2013) developed a web-based information service (SEDIS) to facilitate access to all data, publications, metadata, and information related to over 40 years of scientific ocean drilling (from the DSDP, ODP, and IODP) regardless of origin or location of data. This portal continues through the new phase of IODP (International Ocean Discovery Program) with contributions from the European Consortium for Ocean Research Drilling (ECORD) and MARUM. The three main data contributors to SEDIS currently are the IODP implementing organizations (IOs) from the United States (USIO), Japan (CDEX) and Europe with Canada (ESO). Each IO uses its own drilling platform and its internal data management systems. 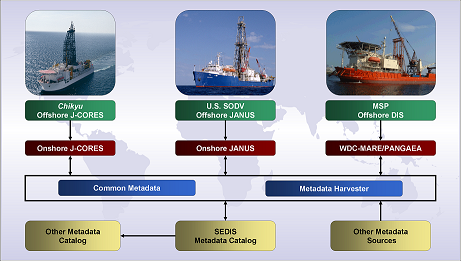 SEDIS serves as a portal for searching the more than 100,000 distributed IODP/ODP/DSDP data sets by utilizing standards-compliant metadata harvested via open-acess protocols. SEDIS could be expanded at a later stage to include other scientific drilling data from continental or lake drilling. Copyright © 2006-2019 IODP-MI. Search engine powered by panFMP.